Our Centers and Institutes work toward full inclusion for all students with disability in higher education, community, and communication. 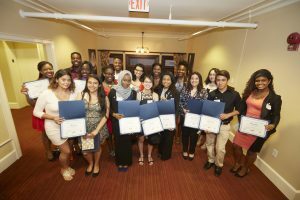 The Center for Academic Achievement and Student Development boasts seven opportunity programs that provide local K-12 and Syracuse University students access to academic support and resources to achieve their goals. The Center for Academic Achievement and Student Development houses seven Academic Opportunity programs that serve all Syracuse University students, as well as students in local K-12 public schools. 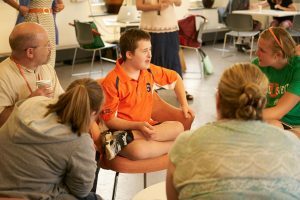 The Taishoff Center is also the home of InclusiveU, which provides fully inclusive higher education opportunities at Syracuse University for students of all ages with intellectual and developmental disabilities. The Lender Center for Social Justice is a University center promoting multi-disciplinary and dynamic collaborations that support the development of courageous and ethical scholars and citizens at Syracuse University who are committed to practices of social justice. The Lender Center for Social Justice aspires to foster proactive, innovative and interdisciplinary approaches to issues related to social justice, equity, and inclusion. The Intergroup Dialogue Program at Syracuse University is deeply involved in the nexus of theory, research, and practice important for intergroup dialogue. Faculty, teaching, and research staff are familiar with and active in various expressions of social justice education. Collectively and individually, we are committed to research that develops an understanding of critical learning processes and change through education. The Center on Human Policy (CHP) is a grant-funded center that supports research, teaching, and advocacy to promote the rights of people with disabilities locally, nationally, and globally, and to facilitate a critical examination of disability as an aspect of diversity in society. CHP was founded in 1971 by Burton Blatt in response to widespread abuse of and discrimination against people with disabilities in society. Over the decades, the Center has engaged in evolving policy, research, and advocacy in, aligned with, and often leading, the national movement to ensure the rights of people with disabilities. Today, the Center continues its long tradition of advocacy and action. Rooted in the belief that all people have value, CHP, through its programs and activities, continuously strives to promote full community participation for people with disabilities.